Use the calendar to find your images. 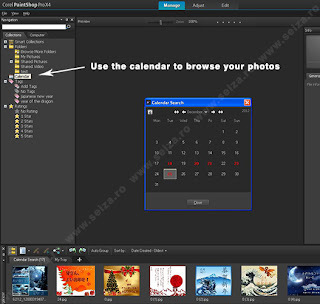 The Calendar search help you to find your photos according to the date they were taken. You can search by a specific date or select a certain period of time. The dates highlighted in the calendar are the dates when the images were created (or edited). Use tags to browse your photos. By adding keyword tags to your images it will be easier to find them. It's better to add multiple tags to a single image (e.g: landscape, forest, name_of_the_project_for_which_you_need_the_image, etc). In the Navigation palette, open the Collections tab; if the tags list is collapsed double-click on Tags button to open it. 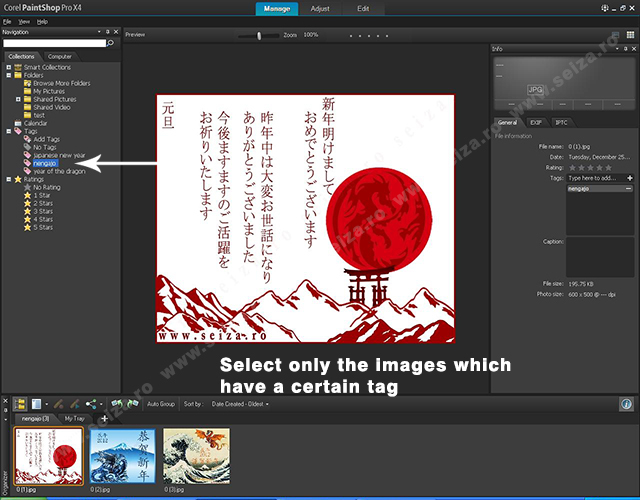 Click on the tag you want to use; all the images associated with that tag will be displayed as thumbnails in the Organizer palette. By clicking the No Tags button will be displayed only the images that have no tags. Sometimes you'll need to delete tags from Tags catalog (when there are too many tags in the list or when you need only several specific tags). 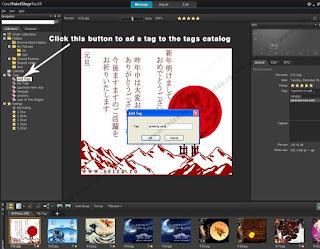 Right-click on the tag you want to delete from Tags catalog and choose Delete. 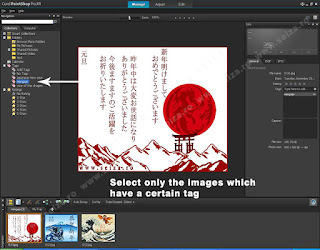 By doing so you'll exclude the tag only from the Tags catalog list; if you want to completely remove one tag from your images you have to use the Info palette. You can also to add a tag in the Tags catalog. 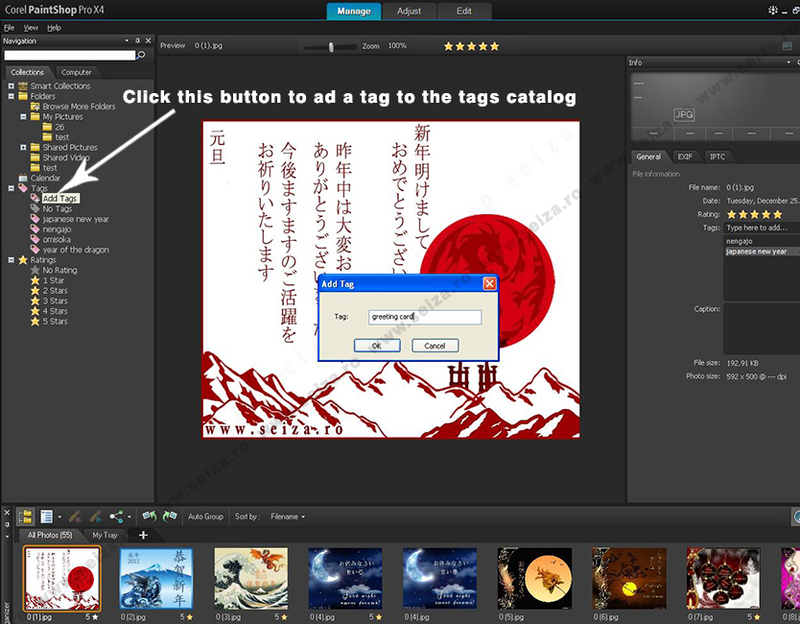 Click the Add Tags button to open the Add Tags dialog box, type the tag and click Ok. The tag will apear in the tags list but there will be no images associated with this tag. 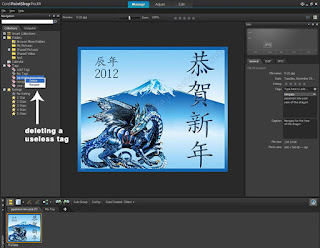 To assign the tag to one or more images, go to the Organizer palette select one or more thumbnails of the images that you want to tag and drag it / them over the tag. The Navigation palette provides you one more useful tool for browsing your images: Display images by image rating. 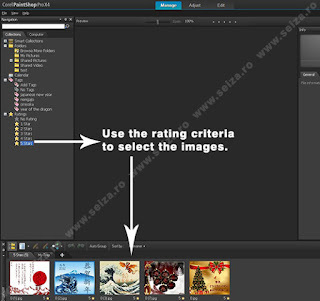 Click on the buttons indicating the number of stars to display the images which match the click on the No rating button to display the images which don't have a rating.